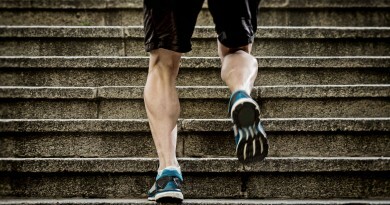 Best known for “goodbye muscle”, the triceps are those, especially women, insist on shaking strongly. Learn how to make them less saggy. The triceps is a large part of the arm, but as it is a muscles that is not used in daily life, it ends up underdeveloped and need an additional effort so that they can become stronger. In addition, getting muscles more defined is more difficult for women than for men, since the percentage of body fat is higher in these areas in women. To make this area of the body firmer, just a specific and regular training will be able to help you. Some of the exercises are very simple and easy to make at home. You can choose to practice the exercises with free weights or using just your body weight. Remain sat with your back straight and your feet on the ground. With a weight in your hand, stretch completely one of the arms above the head, with a weight your hand, and then bend the elbow. Stretch the arm back and so on. Then repeat the movement with the other arm and the same weight. Assume the position required for the normal pushups. You can choose to put your knees on the floor, if it is difficult or uncomfortable, keep your feet on the ground. Instead of positioning the arms apart, as happens in normal pushups, keep them stretched close to the body and shoulder level. After, bend your elbows and lower your chest to the floor as possible. Go back to the initial position with the arms outstretched and then bend them and repeat the movement several times. Make sure to keep the body always well aligned, trying to form a straight line. Sit on the edge of a chair or bench with your hands supported in the seat. Stretch your legs a bit forward. The exercise consists of taking the basin of the chair, bending the elbow and lower the body until your buttock almost touch the ground. Then take it back up to the starting position and repeat the movement again several times. Lying on your back and get some weights. Stretch the arms upwards. Then bend both elbows and bring the weight up to the eyebrow line. Go back to the original position and repeat the movement several times. 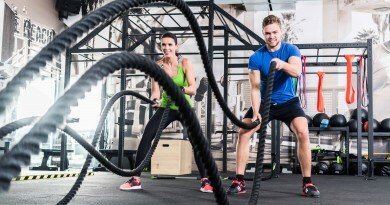 Battle ropes: ever heard of it?